Los Angeles, CA – After a whirlwind year of touring around the United States, Americana songwriter Amilia K Spicer is thrilled to officially release “Harlan” as her third single from “Wow and Flutter.” The music video premieres on September 7th, and the track goes to radio on September 10th. 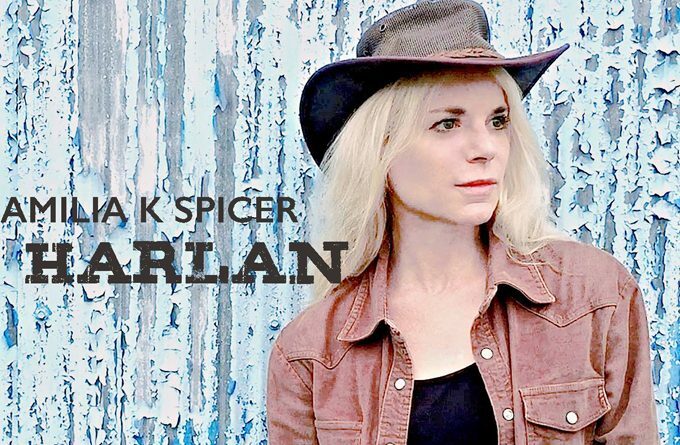 “Harlan” marks Spicer’s third foray into directing music videos for this album, once again producing and filming it with production partner, Edward Romero. Using footage from Harlan and rural Pennsylvania (Spicer’s childhood state), the video follows Spicer’s personal journey to the birthplace of her father. It merges landscapes from both, with vacant lots and abandoned buildings becoming farm landscapes with a golden hue. Spicer’s lyrics are full of vivid imagery, and sensual confessions. As she sings of her dreams “filled with waltzes,” describes the whisky running through her “like Mississippi mud,” and remembers the sound of “a fiddle playing in a child’s room,” the scenes evoke a crystal-clear glimpse into her nostalgia. When Spicer traveled to Harlan to film the music video, she searched for her Father’s home, only to find a mostly barren lot at the address. Amilia K Spicer’s latest album is the triumph Wow and Flutter, which is Spicer’s third release. It landed on many year-end best-of lists for 2017. Despite the acclaim, Spicer retains an underground mystique to her, perhaps due to her “don’t fence me in” attitude (also the name of her record label). In addition to performing, Spicer spends time traveling (recently to Tibet and Bhutan), showcasing her photography, and directing/producing indie films. Throughout 2018, Spicer performed frequently in the Americana festival circuit. She wowed fans with a full band set at the Kerrville Folk Festival in Texas, as well as the Woody Guthrie Folk Festival in Oklahoma. Furthermore, she’s performed more intimately at venues across the US, including 30A Songwriters Festival in January.